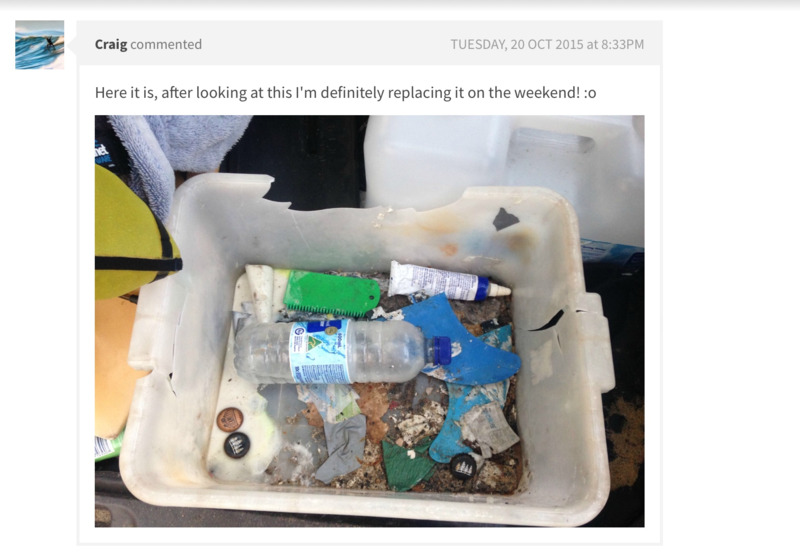 It's about time we started documenting everyone's manky wetty buckets sitting in the back of the car. Don't be shy - c'mon and show everyone just how bad yours is. Only rule is to take out the wetsuit first, to reveal what lies beneath. Let's kick things off with Craig! A stunning first entry from 2015. Who can possibly top this? Hang my head in shame :( hahaha. mine looks positively sterile next to Craigs. wait...i've being doing it all wrong. i lift bucket from car with wetty in it, place under garden tap, fill bucket with fresh water and rinse wetty. you people leave your fins and stuff in it? Yep chook all wrong mate,ya gotta get sand all over wetty throw it in the bucket on top of all the empty maccas wrappers and drink bottles and dirty bits of wax then forget to wash it out and next morning pull up in the dark and cold and remember your wet cold wetty....its all part of the surfing experience. Something new, Aussie made and owned, purpose built to handle the biggest bucket mess. checkout www.buckshotsurfcompany.com.au - and shout yourself. Your Wax is still cheap ...good one. This time last year I could have offered up the entire contents of my “vintage” Commodore wagon. 30 different types of sand, six types of wax wrapper, fins encrusted to the floor by wax, fossilised apple cores, numerous unidentifiable small metal objects that may, or may not, once have been part of the driver’s seat, an ant colony and enough small change to buy a small bottle of water. It’s a bit off topic, or perhaps a new topic, but it would be interesting to see some of your “surf vehicles”. I’m sure there’d be some crew out there with very interesting dedicated surfing only type vehicles. You know that old car, wagon or van full of all their gear that they just use to go for a surf. Maybe even the odd bike, motor scooter or trailer set-up. A few weeks ago I borrowed some wax off old mate who was going through all his surf stuff in the back of his Hi Ace van looking for fins. Turns out he had eleven boards among all the crap and he re-discovered an old fave when counting the boards and looking for the fins, so he surfed that and still can’t find the fin. Yeh it was pretty much like that. 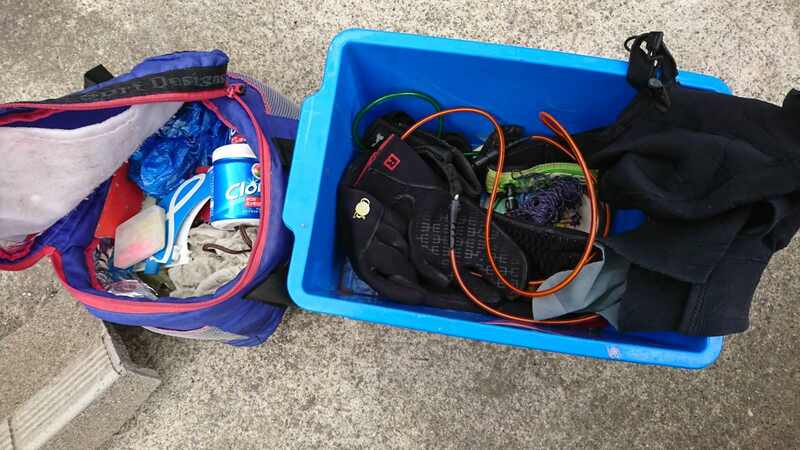 I didn't list the four pairs of boardshorts, three wetsuits, old leg ropes, several towels in varying states of salt encrustation etc etc. But now I have a shiny new SUV that I clean and vacuum regularly........not sure how long that will last but the Commodore was definitely going to struggle with the next rego check and had developed an environmentally damaging appetite for oil. No picture I'm afraid but I got in a fair bit of trouble last week after my wife borrowed my car to take the two little tackers to the shops. Little did she know they were also sharing the ride with 2 piss-soaked wetsuits which had been sitting in the back for over a week fermenting in the sunshine. On the positive side we now not need worry about getting them vaccinated as I'm pretty sure the extreme ammonia levels in the cabin would have killed off any pathogens in their small bodies. I liked the fact that it had a driptray compartment so the wetty could drip dry on the way home and you can pour the water/scum out the spout on the side. [WETSUIT EMERGENCY] Currumbin Wildlife Hospital needs your Old Wetties. Swellnetonians please help save our Aussie Critters. Wetsuits (Neoprene) being a strong flexible fit for administering anaesthetic to wildlife.